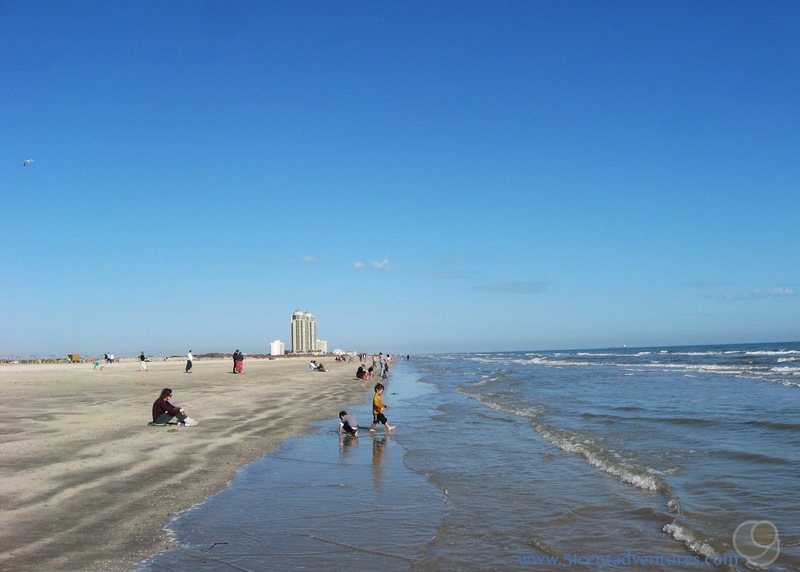 Description: Galveston Island is known for its relaxed beach atmosphere. Large waves from the Gulf of Mexico crash onto the sandy shore tempting you to stop and stay a while. One of the most accessible beaches on the island is Stewart Beach. This large beach has plenty of amenities including restrooms, showers, and beach umbrella rentals. There are also trained life guards on duty. The sand along the shore is kept seaweed free so there is ample room to stretch out on a blanket and enjoy your day at the beach. Location: 201 Seawall Boulevard Galveston Texas. Stewart Beach is located at the very end of Broadway Avenue where it turns onto Seawall Boulevard. Cost: $8 per vehicle. $16 for an oversized vehicle. Operating Seasons and Hours: From Memorial Day to Labor Day the beach is open from 9:00 am to 6:00 pm on week days and open from 8:00 am to 7:00 pm on weekends. From March to Memorial Day and from Labor Day to October the beach hours are from 9:00 to 5:00 on weekdays and 9:00 to 6:00 on weekends. The beach is still accessible during the winter, but the amenities and lifeguards are not available. Over the past several months I've been talking about the different places that my family stopped during our Texas Coastline Roadtrip in November of 2014. 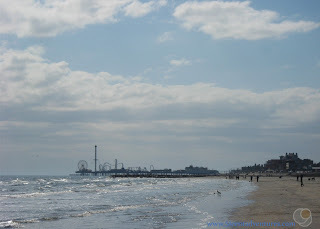 On day six of that trip we were planning to play at a beach on Galveston Island. However, we woke up to rain soaking through our tent at Galveston Island State Park. The rain effectively put an end to our plans to visit any beaches that day. The rain also tainted my memory of Galveston Island, and I realize my last post may have painted a very disappointing picture of the island. 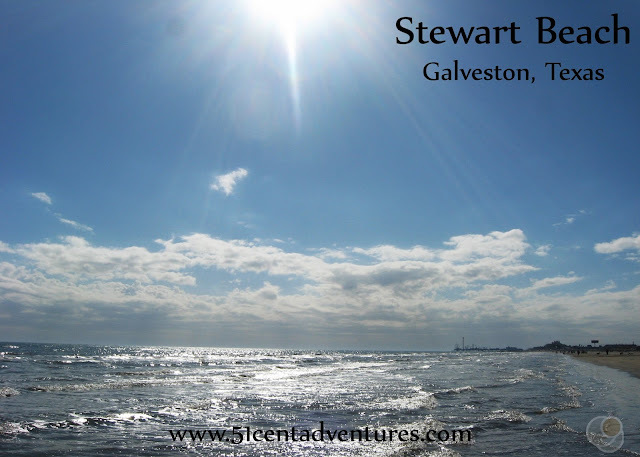 Today I'm going to fix that dismal picture by telling you about two rain-free trips to Stewart Beach on Galveston Island. My husband and I had lived in Texas for a year before we had a chance to visit Galveston Island and see the Gulf of Mexico. 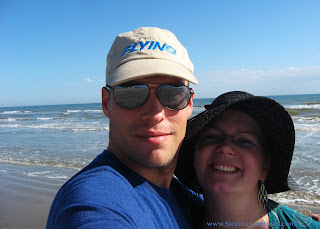 We'd wanted to go earlier, but life got in the way and we just hadn't been able to make the time to visit Galveston. In January of 2014 my husband was getting ready to deploy to South Korea for 9 months. My sister who lives in Houston offered to watch our four kids so that we could have an all day date together before he deployed. 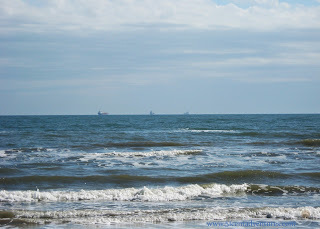 My husband and I decided that we had to go to Galveston Island and see the Gulf of Mexico. So we drove down there. This whole trip had been very spur of the moment so I didn't really know where to go. We ended up just driving down Interstate 45 until it became Broadway Avenue. We drove all the way down that road until it ended at Stewart Beach. If we had been there between March and October we would have had to pay $8 to access the beach. But since this was the middle of January we didn't need to pay a fee. We just drove through the open gate and onto the beach's sandy parking lot. From there we were able to walk right out to the shore. The water was very pretty. The water was cool, but it was comfortable enough that we took our shoes off and splashed in the water as we walked along the shore. We were able to see barges along the horizon as they followed the shipping lanes into Galveston Harbor or continued on to Houston. 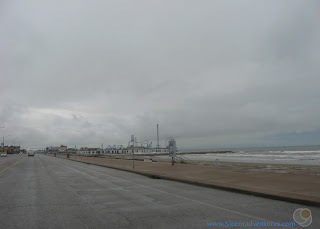 To the west we could see Galveston Island's Historic Pleasure Pier. And to the east we could see the rest of the beach with a lone high rise building in the background. As you can see, we weren't the only people on the beach. Some people were even swimming in the water. 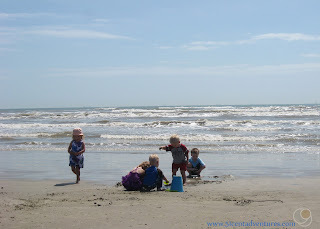 A few months after my husband went to Korea, my sister and I took our kids down to Galveston Island. This would be my kids' first opportunity to see the Gulf of Mexico or really any large body of water. We'd had plans to take the Galveston Ferry over to Crystal Beach on the Bolivar Peninsula, but the day got really crazy. We decided it would be best to just go to Stewart Beach. This time we had to pay the $8.00 entry fee. My sister had never been to this beach before, but she said that it was cleaner that the free beaches she had visited. She also remarked that the parking lot made it really easy to access the beach. 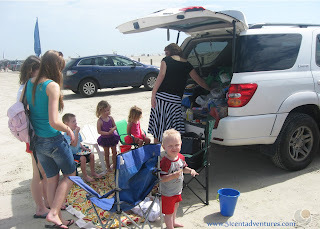 In fact, we had a quick tailgate style picnic in the parking lot before we even went to the water. My sister explained that she's learned to just eat before going to the beach because otherwise all the food ends up covered with sand. The kids were very excited when we did head down to the water. They spent hours playing in the sand and even splashed in the water a little bit. We didn't use them on our visit, but Stewart Beach does have shower facilities and restrooms. Other amenities include a pavilion, concessions, and chair and umbrella rentals. There is also a McDonalds located next to the entrance to the beach. However, be aware that the $8.00 entrance fee is good for one entry. If you leave the park in your vehicle you will have to pay the fee to re-enter. When we finally did leave the beach all the children were absolutely exhausted from all their playing. They slept the whole way back to Houston. Come to think of it, the fun that I had on these two trips to Galveston Island must have influenced me when I got the idea for the Texas Coastline Road Trip at the end of the year. I don't think I would have planned to visit beaches near South Padre Island and Corpus Christi if I hadn't had a positive experience on Galveston Island. Recommendation: Stewart Beach is a great place to relax and play in the sand and water. Perhaps there are better beaches in the area, but none have the convenience of Stewart Beach. Directions: If you are travelling from the mainland just stay on I-45 as it crosses the causeway onto Galveston Island. I-45 becomes Broadway Avenue which will take you all the way to Stewart Beach. If you are already on the island you can get onto Seawall Boulivard and travel east to where Broadway turns onto Seawall. Either way you'll know you're almost at Steward beach when you come to the McDonalds. 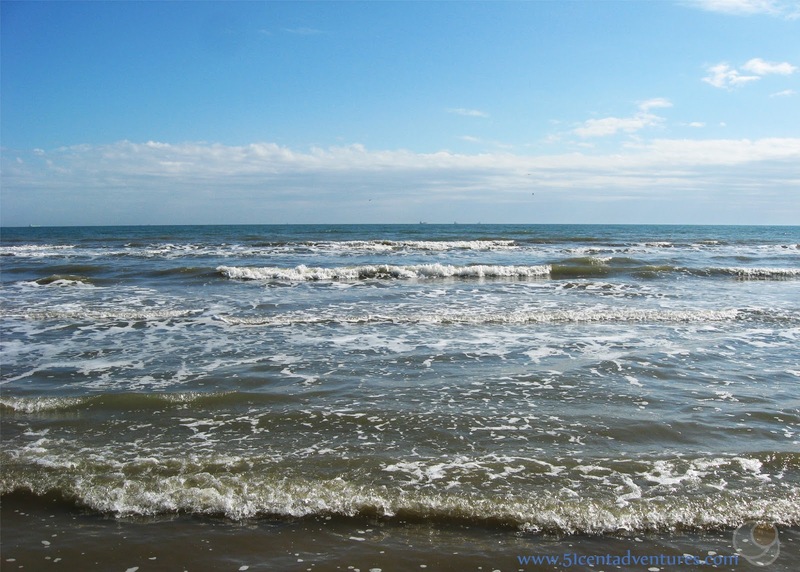 Places Nearby: Stewart Beach isn't the only beach on Galveston Island. East Beach is located farther east along Seawall. East Beach also costs $8.00 and has many of the same amenities as Stewart Beach. The main difference is that alcohol is allowed at East Beach. Seawall Urban Park is another popular beach. This beach stretches for 10 miles along the south side of Seawall Boulevard. You can access the beach by parking along the side of the road and then walking down to the water. There are staircases down to the beach along the sidewalk. You have to pay to park, but at only $1 an hour or $8 a day it is a pretty good deal. This is a picture I took of the beach from Seawall Boulevard. This was during our road trip. You can see why we didn't want to get into the water. When it's not rainy the water looks much more inviting. 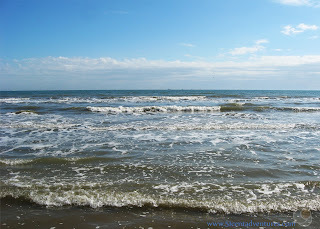 There are also several pocket park beaches on Galveston Island. 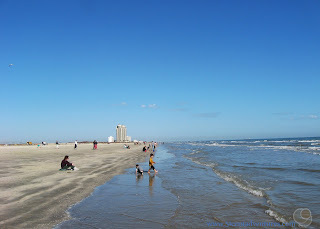 Check out this link to Galveston.com for more information about all the beaches. Next Stop: Texas Seaport Museum.